YOU ARE INVITED TO AN ENDING! 25 October, Wednesday, 5:30 p.m., at the Pakrantė gallery space (Vaidilutes st. 79, Vilnius). 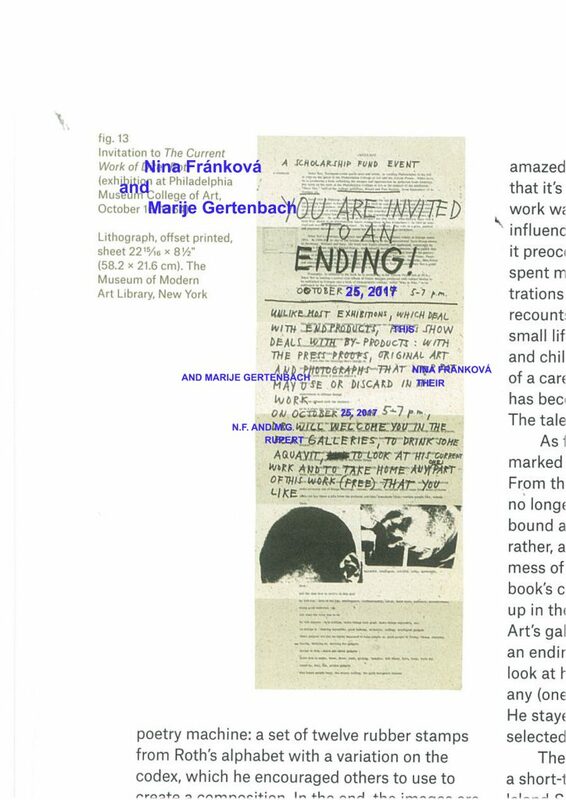 Unlike most exhibitions, which deal with end products, this show deals with by-products: with the press proofs, original art and photographs that current artists-in-residence Nina Fránková and Marije Gertenbach may use or discard in their work. Nina Fránková and Marije Gertenbach will welcome you to look at their current work, drink some aquavit, and to take home any one part of the presented work (free) that you like. Marije Gertenbach (b. 1990, NL) currently works and lives in Amsterdam, The Netherlands. Gertenbach graduated from Amsterdam University of the Arts, in 2015-2016 was artist-in-residence at Residency Rijksakademie voor Beeldende Kunsten, Amsterdam. She uses painting as main communicator. In her work she is looking at different ways a painting takes place in society and what sort of role it could play. She is concerned with creating confusion and emphasizing the ambiguity of our ritual engagement with objects and spaces. A painting is never a static object, but always in motion. Nina Fránková (b. 1987, CZ) works across sculpture, photography, moving image, text, design, drawing, site-specific projects and interdisciplinary research. Fránková lives and works between Amsterdam and Prague. She has BFA from ceramics at Rietveld Academy Amsterdam and in 2014 she gained MFA from Fine Arts at Sandberg Institute in Amsterdam. She has received the Mondriaan fonds Werkbijdrage Jong Talent for 2016-2017 (Netherlands). Her artistic practice has background in children’s games in woods, interior design and ceramics. During past decade she gradually launched her own designer porcelain label. In 2013 she co-founded collaborative project Ancient Acrobatics investigating in art and folklore. Rupert Residency program is kindly supported by Lithuanian Council for Culture, and Lithuanian Ministry of Culture.